So we’re now exactly four weeks from the completion of the Skyscraper Throne Trilogy. I’m going to be around and about the place to read, be interviewed pop up on panels and convention dancefloors and generally shill myself like a £5.99 miracle diet pill. 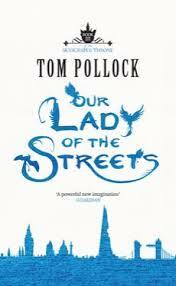 7 August 6pm- The Official OUR LADY OF THE STREETS Launch Party, Forbidden Planet, London. *GASP* at the quality of the homemade brownies, *MARVEL* at the adventures of Elizabeth Bradley and Parva Khan, spilling from my very lips. *TOLERATE* my nerve-induced attempts are making you laugh. RSVP here if you’re a Facebook kind of person. We’ll be heading to the Pillars of Hercules in Soho for drinks, chatter and collapsing. from about 7.30 if you can’t make the signing. Seriously guys, I cannot even begin to tell you how much of a blast this was last year. And this year, Nick Harkaway, Sarah Lotz, Scott Lynch and Elizabeth Bear will be there. Come geek out with us! Come hang with me and a shitload of excellent fantasy authors including Joe Abercrombie, Lauren Beukes, Ben Aaronnovitch at one of the best indie bookshops in London. You’ll need a ticket, but you can get one at the link above. This is the daddy. I’d list the amazing people who are coming, but I’d still be here typing when next year’s convention comes around. If you aren’t already coming, do. And if you are coming, say hi! I’ll see you at Nine Worlds. I thought it sounded more fun than WorldCon and I can’t justify two expensive weekends away in the SAME MONTH. Seems to be a crazy amount of event son this summer. Have fun with all your dancing and schmoozing.